So be wary of people or products that focus on outcome (“instant weight loss”) over process (“this can help you in your work of getting to a healthy weight”). Focus on the journey rather than the destination. There are no elevators to the top of the mountain you are climbing. Put excellence before success and you will get there. Get to the top of that mountain in 2018. 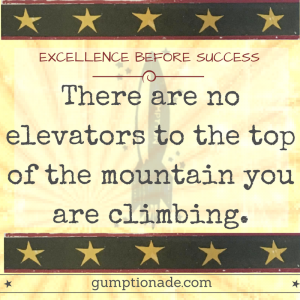 Let Gumptionade – The Booster for Your Self Improvement Plan help you get there.